After much feedback from users to my previous website design for SayNoTo1890.com, I have made some changes. Hopefully people will find this version of the site a lot more user friendly. Please let me know your thoughts – drop me an e-mail, or leave a comment below. I’ve written on Monday and Tuesday about the new ComReg consultation paper that is looking to deal with the reason behind this site – the increased cost of calling 1890/1850/0818 numbers from mobile phones and landline users using bundles of minutes. Firstly, let me apologise for inviting you to read the consultation paper itself. Having read through it myself, it’s a nightmare to try to understand. Whether that’s done on purpose, or not, it’s hard to know. However, the heart of the matter resides on page 40 out of 42 where the paper reviews “Impact assessment and preferred option”. ComReg considers that the most appropriate and consumer-friendly way to address all of the issues associated with more transparent consumer call charges is to include calls to 1850, 1890, 0818 and 076 in tariff bundles offered by fixed and mobile operators. This move would greatly enhance transparency as customers could then be able to call these numbers with confidence knowing that the cost would be deducted from their remaining minutes. ComReg considers that the issue of bundling lies within the realm of the operator‟s commercial freedom and it therefore limits itself, for the moment, to encouraging operators to implement this option without delay. Are people in agreement? In what seems like the simplest solution in the document, a change is made that requires operators to include calls made to these numbers in bundled minutes rather than separately charge. At least when it comes to 1850 and 1890 numbers? The fact that these were originally excluded from bundles was the key reason for setting up this website in the first place. From my perspective, I would personally call for abolishing the 0818 numbers – these are basically a “poor mans” premium rate number. Consumers calling these numbers are paying money directly into the pocket of the company they’re calling, as well as paying for the cost of the call as well. Do away with it, prevent businesses from providing customer care lines on premium rate lines, and be done with the 0818 completed. The impact analysis in the document doesn’t see any “down side” to this proposal for 1890 and 1850 numbers. Let me know your thoughts. If people are in agreement, I’ll submit a response on behalf of the users of this website in favour of their preferred option – with the extra suggestion that 0818 numbers be done away with completely. Over on SayNoTo1890.com this morning, I’ve published an update that gave me a little buzz when I was writing it. After 3 years of providing geographical alternative numbers to 1890, 1850 and 0818 numbers to save mobile and landline (with bundles of minutes) users money on their phone calls, it looks like ComReg might be about to do something. ComReg have recently published a Consultation paper for review and response by interested parties before close of business, Friday September 17th. This consultation paper is extremely relevant to this particular site as it relates to the usage, advertising and charging related to 1890, 1850 and 0818 numbers. ComReg has received a continuous flow of complaints from service providers and consumers about the cost of 1850 and 1890 numbers in recent years and has engaged with industry to attempt to improve the situation, with very limited results. Eircom, which is one of the main hosts for 1850/1890, has adjusted its charges and this has brought some improvements that help service providers but the main problems remain. 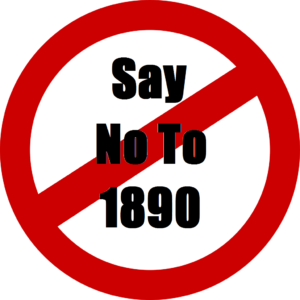 Whilst service providers are dissatisfied with the cost burden associated with terminating 1850 calls, the apparent dissatisfaction amongst end-users is mainly with the origination9 charges associated with calling 1890 numbers when calls are made using a mobile phone. This dissatisfaction is exemplified by the rise over some years of a web-based campaign called “Say „No‟ to 1890”. This campaign identifies many major companies using 1890 and advises customers to ring alternative geographic numbers – which are provided on the web site – to reach those companies. This is obviously a very welcome move if it addresses the issues that have necessitated the creation of the website in the first place. I’m still in the process of reviewing the documentation myself as it’s obviously of key importance to what the website was set up to address. I’m not sure I fully appreciate, on first reading, what’s being proposed in this document, but more examination is necessary. For users of this site, and anyone familiar with SayNoTo1890.com, I’d invite you to have a read through of the document also, and please contact me here and let me know your thoughts and feedback. I’ll compile a single response on behalf of the users of SayNoTo1890.com and ValueIreland.com readers. The consultation paper can be downloaded from this link (pdf document). Due to website visitor feedback, I’m making some changes. The new website should be available on Saturday morning, March 12th. In the meantime, thank you for your feedback.